Alistair Begg, Sinclair Ferguson, Steven Lawson, R.C. Sproul Jr., R.C. 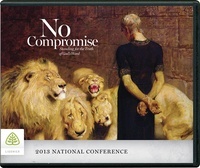 Sproul, Cal Thomas, and Ravi Zacharias considered the theme No Compromise: Standing for the Truth of God’s Word at our 2013 National Conference. Together they examined what the Bible says about standing firm for bedrock truths such as the resurrection of Christ, the trustworthiness of Scripture, God’s plan for the family, our need to show mercy, the importance of theology, the primacy of preaching, the exclusivity of Jesus and much more. Note: Orders expected to ship within 3 weeks.